Many family law attorneys are aware of the importance of filing a Pension Division Order that includes Survivor Benefits for an Alternate Payee during a divorce but rarely consider the reversionary options of a defined benefit plan. This article defines a reversionary interest in a defined benefit plan, reviews the effects of choosing a Shared or Separate Interest Division Method, and discusses how Contingent Alternate Payees can change reversion to the Participant. Reversion of the benefit is an important strategic consideration to have documented when negotiating the allocation of a Pension. WHAT IS A REVERSIONARY INTEREST OF AN ALTERNATE PAYEE’S BENEFIT? A Shared Interest Order is an Order that does not allow an Alternate Payee to receive a benefit until the Participant begins receiving a benefit. If a survivor benefit is elected for the Alternate Payee the monthly benefit can be reduced for the cost of the benefit. Upon the death of the Alternate Payee the benefit reverts back to the Participant if he or she is still alive. Many State, Federal, and Military Plans require this kind of Order, though Federal Plans allow the Alternate Payee to choose their estate or surviving children of the marriage to receive the benefit after his or her death as long as the Participant is still receiving benefits. A Separate Interest Order is an Order that allows the Alternate Payee to receive a benefit at the Participant’s earliest retirement eligibility independently of the Participant. Once the Alternate Payee begins receiving a benefit it is payable until the later of his or her death or the term certain. If the Alternate Payee dies before receiving any benefits the benefit usually reverts back to the Participant, though some plan administrators have taken the position that the benefit is lost. Some plans (United Parcel Service & Boilermakers) allow Contingent Alternate Payees who can continue to receive a benefit after the death of the Alternate Payee. Contingent Alternate Payees are a spouse, former spouse, child, or other dependent of the Participant (ERISA §206(d)(3)(k)). Payments to Contingent Alternate Payees end upon the death of the Participant unless a single life annuity with a term certain benefit was chosen by the Participant. If the Alternate Payee dies after commencement of his or her benefits (and before the Participant), payments will continue to the contingent alternate payees in the form of benefit chosen by the Alternate Payee. If the Alternate Payee dies prior to the commencement of his or her benefits (and before the Participant) the Contingent Alternate Payee may elect to commence benefits in any of the forms of benefit made available to contingent alternate payees. 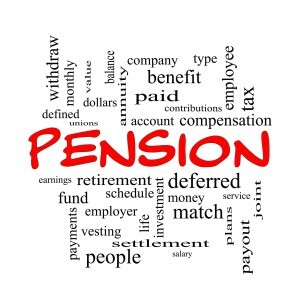 Suggested Pension Orders propounded by a Pension Plan may not show all these options. For assistance in strategies involving the negotiation of Pensions in Divorce and the preparation of Court Orders to divide pensions call Hoffman Divorce Strategies at 985—674-1120 or check out our website at http://www.hoffmandivorcestrategies.com/qdro-and-pension-order-services/.